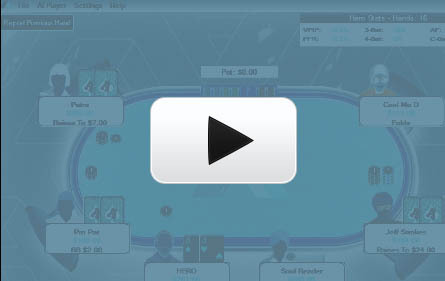 Learn how to beat today's tough No-Limit Holdem Poker Games with your own personal poker coach. Ace Poker Coach is a virtual poker coach based on award winning poker AI. If you own the PRO version of Ace Poker Coach, and you'd like to purchase an additional year of APC AI updates, click on the button to the right. Please note, you do NOT need to purchase an AI update after your 1-year of updates expires. Ace Poker Coach will continue to function as always, you won't however be able to keep up with the latest improvements in the AI. AI updates are constantly being done, so if you want the best from your software, purchase an additional year. If you own the GOLD version of Ace Poker Coach, lifetime updates are included at no cost. Ace Poker Coach uses a combination of advanced expected value game theory mathematics, real player database analysis, and logic tree decision making to produce as realistic a simulation as possible. Designed by long term winning poker pro's, Ace Poker Coach knows what real poker players who are looking to beat today's games need. Ace Poker coach provides helpful advice that's applicable and produces long term positive results.